An RSS feed (or news feed) is a means by which you can stay informed about what's going on at Bel Canto Singers Bunbury without having to regularly visit the website. Who are Bel Canto Singers Bunbury? We are a Non Auditioned Choir who love to sing, perform and socialise together, the choir was founded in 1998 and we have just recently celbrated our 20th anniversary we had a great concert in May, We are actively engaged with the local community, singing at local events and supporting other choral performances. We stage our annual variety concert in support of Youth Care usually in October. Our musical director is Suzanne Leclair, Suzanne joined our choir in May 2018 she is a fun vibrant conductor and continues to develop our singing our sound and our capability. Our practice nights are fun, friendly and relaxed, new singers are most welcome, and you are entitled to 3 visits before commiting, our membership are also very reasonable, so come along and give us and singing a go we are sure you will love it..
All our Practices and rehearsals are open to the public and to potential new members, so why not pay us a visit. We practice every Tuesday evening at 7pm, at St Augustines Church, 119 Mangles St, Bunbury. 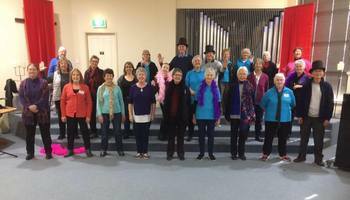 Want Bel Canto Singers Bunbury to sing at your next function? Why not hire Bel Canto Singers Bunbury to entertain at your next event? We can perform at corporate functions, charity events, community Entertainment events, birthday parties, christmas parties, awards nights, weddings, engagements, anniversaries, engagements, and even funerals and memorial services. Starting from the 7th Feb 2017.